End-stage renal disease (ESRD) patients with diabetes have been regarded as being at the highest risk of cardiovascular disease. We therefore investigated the relationship between diabetes and the incidence of peripheral artery disease (PAD) in new haemodialysis patients. We enrolled 1,513 ESRD patients who had just begun haemodialysis therapy. They were divided into two groups: those with (n = 739) and those without diabetes (n = 774). The endpoint was the development of PAD, defined as ankle brachial pressure index ≤0.9 or toe brachial pressure index <0.7 in patients with an ankle brachial pressure index >0.9. According to the Kaplan–Meier method, the 10 year event-free rate for development of PAD and lower limb amputation was significantly lower in the diabetes group than in the non-diabetes group (60.3% vs 82.8%, HR 2.99, 95% CI 2.27, 3.92, p < 0.0001 and 93.9% vs 98.9%, HR 5.59, 95% CI 2.14, 14.7, p = 0.0005 for PAD and lower limb amputation, respectively). In patients with diabetes, quartile analysis of HbA1c levels showed that the highest quartile group (≥6.8% [51 mmol/mol]) had significant development of PAD and lower limb amputation compared with lower quartile groups (PAD HR 1.63, 95% CI 1.17, 2.28, p = 0.0038; lower limb amputation HR 2.99, 95% CI 1.17, 7.70, p = 0.023). Diabetes was a strong predictor of PAD after initiation of haemodialysis therapy in patients with ESRD. In addition, higher HbA1c levels were associated with increased risk of developing PAD and requiring limb amputation in such diabetic populations. It is well known that cardiovascular disease is a major complication and the leading cause of death in patients on haemodialysis [1, 2, 3, 4]. In addition, peripheral artery disease (PAD) is commonly seen in patients on haemodialysis [5, 6]. PAD is critical because it is an independent predictor not only of all-cause mortality, but also of cardiovascular events in patients with end-stage renal disease (ESRD) [7, 8]. Furthermore, amputation in haemodialysis patients with PAD is known to worsen clinical outcomes . It could therefore be important to stratify patients by risk in order to detect those who are likely to undergo amputation and/or have worse clinical outcomes. On the other hand, diabetes mellitus is considered to contribute to an increase in coronary heart disease [10, 11, 12]. Patients with diabetes mellitus are also at high risk of death from cardiovascular disease. In addition, poor glycaemic control is strongly associated with the development of ischaemic heart disease in patients with diabetes mellitus [13, 14]. Thus there could be an association between the prevalence of diabetes mellitus and/or poor glycaemic control and the development of PAD. Recently, about half of ESRD patients in the USA and Japan have required haemodialysis due to diabetes mellitus [15, 16]. We therefore investigated the relationship between diabetes mellitus and the incidence of PAD in ESRD patients starting on haemodialysis therapy. This study was of patients with ESRD who were started on haemodialysis therapy in Nagoya Kyoritsu Hospital between August 2000 and November 2007. All participants underwent measurement of ankle brachial pressure index (ABI) and toe brachial pressure index (TBI) as the initial screening for detection of PAD; those with pre-existing PAD at the time were excluded. Diagnosis of PAD was by the following criteria: (1) ABI ≤0.9; (2) TBI <0.7 in patients with ABI >0.9. A total of 1,513 patients were enrolled in the study and divided into two groups: those with (n = 739) and those without diabetes (n = 774). All patients were screened by ABI measurement and clinical observations every year from inception of haemodialysis therapy. They were followed up for up to 96 months. The endpoint was development of PAD. The incidence of amputation was also determined. Amputation was performed when uncontrollable limb infection existed even after revascularisation and/or medical treatment. Major amputation was defined as above-the-ankle amputation. Blood data were analysed from fasting blood samples obtained from veins between 07:00 and 08:00 hours following a non-dialysis day within 1 month of starting on haemodialysis therapy. 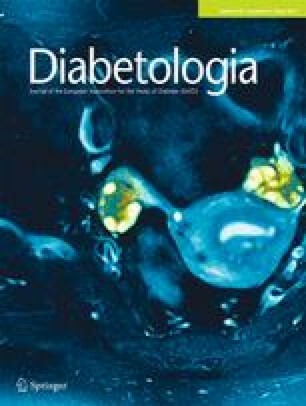 Diabetes mellitus was diagnosed if patients had a history of diabetes, a fasting plasma glucose concentration of >7 mmol/l, a random plasma glucose concentration of >11 mmol/l and/or HbA1c levels of ≥6.5% (48 mmol/mol). Hypertension was defined as a history or presence of hypertension, or systolic blood pressure >160 mmHg and/or diastolic blood pressure >90 mmHg. Other data were obtained from hospital charts and telephone interviews with patients by trained reviewers blinded to patients’ clinical backgrounds. The study protocol and use of chart reviews were approved by the institutional ethics committee and written informed consent was obtained from each patient. Statistical analyses were performed using SAS 6.10 (SAS Institute, Cary, NC, USA). HbA1c and C-reactive protein levels were expressed as median and interquartile range. Other continuous variables were expressed as mean±SD. Variables were compared using Student’s t test, ANOVA or the Kruskal–Wallis test. A χ 2 test was also used to compare categorical variables. Cumulative survival rates in each group were estimated by the Kaplan–Meier method and logrank test. In patients who died during follow-up, the observation was censored at the time of their death. Hazard ratios and CIs were calculated for each factor by Cox univariate analysis. Then prognostic variables with p < 0.05 were entered in the Cox multivariable analysis in order to determine independent predictors. Follow-up was concluded on 31 August 2010. The mean duration of follow-up was 51 ± 33 months. Table 1 shows baseline characteristics. There were significant differences in distribution of the sexes, BMI, ABI, haematocrit levels and albumin levels between the two groups. In the diabetes mellitus group, 161 (21.8%) patients experienced PAD events; the corresponding value in the non-diabetes mellitus group was 74 (9.6%). According to the Kaplan–Meier method, the 10 year event-free rate for development of PAD was 60.3% in the diabetes mellitus group and 82.8% in the non-diabetes mellitus group (HR 2.99, 95% CI 2.27, 3.92, p < 0.0001) (Fig. 1). After adjusting for other risk factors at baseline, prevalence of diabetes mellitus, age and albumin were independent predictors of PAD (diabetes mellitus HR 2.94, 95% CI 2.21, 3.92, p < 0.0001; age HR 1.03, 95% CI 1.02, 1.04, p < 0.0001; albumin HR 0.74, 95% CI 0.57, 0.97, p = 0.028) (Table 2). Lower limb amputation was needed in 21 (2.8%) patients in the diabetes mellitus group and five (0.6%) in the non-diabetes mellitus group. Major amputation occurred in seven (0.9%) and two (0.3%) members of the study groups, respectively. The 8 year event-free rate for amputation was 93.9% in the diabetes mellitus group and 98.9% in the non-diabetes mellitus group (HR 5.59, 95% CI 2.14, 14.7, p = 0.0005) (Fig. 2). Independent predictors of amputation were diabetes mellitus and C-reactive protein levels (HR 5.29, 95% CI 2.00, 13.9, p = 0.0008 and HR 1.01, 95% CI 1.00, 1.02, p = 0.047, respectively) by Cox multivariate analysis (Table 2). Patients with diabetes mellitus were divided into quartiles according to HbA1c levels (first quartile [Q1] <5.4% [36 mmol/mol], second quartile [Q2] ≥5.4% to <6.0% [36–42 mmol/mol], third quartile [Q3] ≥6.0% to <6.8% [42–51 mmol/mol] and fourth quartile [Q4]: ≥6.8% [51 mmol/mol]). Baseline characteristics are shown in Table 3. PAD events occurred in 18 (9.9%) patients in Q1, 39 (20.9%) patients in Q2, 44 (23.3%) patients in Q3 and 60 (33.1%) patients in Q4. According to the Kaplan–Meier method, the 8 year event-free rate for development of PAD was 81.9% in Q1, 63.2% in Q2, 62.8% in Q3 and 48.7% in Q4 (p = 0.0078) (Fig. 3). Even in Cox multivariate analysis, the categorised HbA1c level was independently related to development of PAD (Table 4). In addition, the incidence of PAD significantly increased in the highest quartile group (Q4) compared with the lower groups (Q1–Q3) (HR 1.63, 95% CI 1.17, 2.28, p = 0.0038). Regarding lower limb amputation, one (0.9%) patient in Q1, four (2.1%) in Q2, five (2.6%) in Q3 and 11 (6.1%) in Q4 required amputation. Major amputation (n = 7) was only seen in Q4. The 8-year event-free rate for limb amputation was 99.3% in Q1, 97.2% in Q2, 97.4% in Q3 and 89.3% in Q4 (p = 0.05) by Kaplan–Meier (Fig. 4). When compared with Q1 to Q3, the highest quartile (Q4) was significantly related to incidence of lower limb amputation (HR 2.99, 95% CI 1.17, 7.70, p = 0.023). The major finding of the present study is that diabetes mellitus strongly predicted the development of PAD after the start of haemodialysis therapy. Interestingly, higher HbA1c levels when beginning haemodialysis were associated with an increased risk of PAD and amputation in patients with diabetes mellitus. A previous report has suggested that the 1 year mortality rate increases with more advanced stages of chronic kidney disease in PAD patients with critical limb ischaemia . Our findings could therefore contribute to the risk stratification of patients starting on haemodialysis therapy. ABI has been widely used to diagnose PAD. However, patients with dialysis and/or diabetes frequently have medial artery calcification, and especially a high or normal ABI value. In such patients, guidelines recommend the use of TBI [18, 19]. Thus, the diagnosis of PAD in the present study was defined as ABI ≤ 0.9 or TBI < 0.7 in patients with ABI > 0.9. In patients with renal dysfunction, there is a strong association between this condition and systemic atherosclerosis [20, 21, 22]. Uraemia-related risk factors including haemodynamic overload and abnormal calcium metabolism greatly impact on arteriosclerosis . Therefore, haemodialysis itself could greatly influence the development of PAD. In addition, several atherosclerotic risk factors, including diabetes mellitus, are common in patients on haemodialysis. Indeed, diabetes mellitus and haemodialysis both induce oxidative stress and an inflammatory status, resulting in progressive atherosclerosis and vascular complications [24, 25]. Jude and co-workers have shown that patients with diabetes and PAD had a worse clinical outcome, including increased risk of amputation . However, only limited numbers of patients had renal insufficiency in their study. Speckman and co-workers reported that lower limb amputation is more likely to be observed in new haemodialysis patients with diabetes mellitus than in those without diabetes mellitus during a 12 month follow-up period . In the present study with a much longer follow-up period, we found that diabetes mellitus predicted not only lower limb amputation, but also the development of PAD in new haemodialysis patients. In this context, our findings may be considered to be new. One of our important findings was that higher HbA1c levels (which imply poor glycaemic control) at the start of haemodialysis predicted the development of PAD and amputation of lower limbs. A recent study has shown that HbA1c is a risk factor for all-cause death and sudden cardiac death in diabetes mellitus patients on haemodialysis . To date, data on a possible association between glycaemic control and the risk of PAD events in diabetes mellitus patients on haemodialysis are limited. Moreover, the incidence of PAD in this population is not well known. Our data suggest that interventions targeting glycaemic control might, in addition to control of other risk factors, also improve clinical outcomes even in ESRD patients requiring haemodialysis therapy. Further studies are warranted to determine whether glycaemic control does indeed inhibit the development of PAD and prevent amputation in such a population. There is considerable evidence that medications such as aspirin, statins, ACE inhibitors and angiotensin II receptor blockers improve clinical outcome in patients not on haemodialysis. However, evidence-based assessments of medical therapies have been limited in haemodialysis patients . Although adequately powered clinical trials on such medications in haemodialysis patients are still needed, it seems likely that intensive medical intervention might improve the prognosis in haemodialysis patients with diabetes mellitus and/or poor glycaemic control. Indeed, we have already reported the effectiveness of cilostazol in haemodialysis patients with PAD, although the data reported on were retrospective . There are several limitations to the present study. First, this study was performed in a single centre, and multi-centre studies with large populations would be warranted to corroborate our findings. Second, all patients enrolled were Japanese. Body mass index, lipid profiles and other factors were quite different from those in Western countries. In addition, the prognosis in Japanese haemodialysis patients is relatively better . The rate of limb amputation was also quite low in the present study. A third limitation is that we checked the prevalence of diabetes mellitus and glycaemic control at the start of haemodialysis. Therefore, we were not able to estimate the diabetes mellitus status and glycaemic control after beginning haemodialysis therapy. In addition, we did not analyse the duration of diabetes mellitus. Earlier data have suggested an association between the duration of diabetes mellitus and advanced atherosclerotic lesion formation . Finally, although we checked ABI and TBI, occult PAD might still have been missed at the initial screening and during follow-up. In conclusion, our findings suggest that the presence of diabetes mellitus strongly predicted PAD after initiation of haemodialysis therapy in patients with ESRD. Our findings also suggest that poor glycaemic control, defined as raised HbA1c levels, was associated with increased risk of developing PAD and of undergoing lower extremity amputation among such patients with diabetes mellitus. A large cohort study is needed to confirm the results. This study was supported by a grant from the Aichi Kidney Foundation and a Grant-in-Aid for Scientific Research (KAKENHI) (no. 22790699) of the Japanese Ministry of Education, Culture, Sports, Science and Technology (MEXT) and the Japanese Society for the Promotion of Science (JSPA). All authors were involved in the conception and design of the study, or analysis and interpretation of data. In addition, all authors contributed to the drafting of the article or its critical revision for important intellectual content. All authors gave final approval of the version to be published.